In previous years, the show may have found a way for the characters to work their way out of all forms of trouble but this time – while the short-term goals were achieved – the risks to their safety were still very much present. Fawn was found – companionating with her boyfriend, whom Tig incorrectly thought was connected to the One-Niners – and given money to get out of town until it was safe; while the CIA/Carter double act used their contacts to secure the safety of Jax, Chibs and Tig in prison. However, there was no fast quashing of the chargers by Romeo and the RICO case still hangs over the club, though only Jax and Bobby are aware of that particular threat. Tara: Here? In a brothel? Wanted for murder? Jax: Hey – I’m all about the fairytale. At the end of the hour, Opie turned up at the club just as the cops arrived to take his brothers into custody and was able to ensure he could stay close to Jax by punching Sheriff Roosevelt and being arrested as well. It appeared noble, but turned out to be a fatal decision. The setup for the third episode was much the same as the second, as Jax was put into a seemingly impossible situation and the expectation was that the hour would be spent with him finding an escape hatch. Inside San Jose County Correction Facility, Teller, Chibs and Tig avoided being shivved within moments of their arrival, thanks to the protection that Romeo had secured. However, their new foe, Damon Pope, had enough influence to engineer a meeting with Jax in the commander’s office. Pope informed our hero that, as repayment for the loss of his daughter, half ($50k) of the earnings from every drug shipment SAMCRO helped the cartel with was his; Tig was to spend the rest of his life in jail; and one of the other Sons must die, as compensation for the One-Niner who died in the freeway shootout. Jax protested that he would not kill one of his club and did not want to go to war, but Pope assured him “You’re already in it, son”. On the outside, Gemma had not been authorised to see her grandkids at their daycare, so tried to cause problems for her new daughter-in-law by giving (false) ammunition to Wendy – Abel’s birth mother – for her to use against Tara. Nevertheless, the surgeon was not rattled by either of the other women who have been in her husband’s life, telling his ex-wife to “bring it on” and, even more frighteningly, Gemma that she loved her, but would ensure Jax killed her if necessary. Perhaps because she was made to feel inept by Tara, Gemma flips out when she discovers that Clay has visited Nero’s establishment and beats his companion to a bloody pulp in retaliation. As a result, the girl – Emma – contacts the authorities and Gemma ends up chained to a bench with employees at the brothel. These developments were only a side thought however, as the fate of the four club members on the inside was still being determined. Jax tells the others that they must go into solitary to discover the rest of Pope’s demands, so they begin a prison yard fight with the inmates who had wanted to attack them upon their arrival. When they are in there, Teller tells Opie the unadulterated truth – from the letters between his father and Maureen Ashby, to Clay killing JT, the reason Piney was murdered, the RICO case, and that he must decide which of the Sons will leave jail in a body bag. 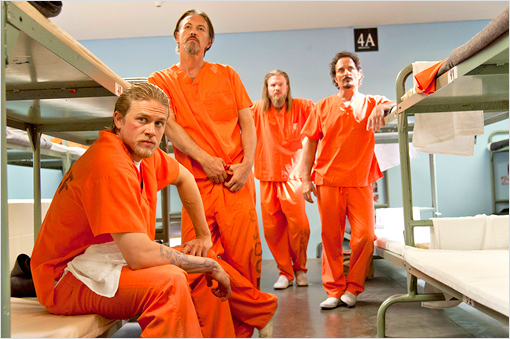 When Jax tells him that he had to keep Clay alive to save the club, Opie points out that he made the wrong choice but, when Teller steps forward to sacrifice himself, he is prevented from doing so by his friend who steps into the box to face the One-Niners. The actions of Tig and Clay have no directly or indirectly led to the death of Donna, his wife, Piney, his father, and now, Opie himself. His death scene was shocking and brutal, but perhaps just as surprising was the ruthlessness Jax displayed in using the event to his own advantage, as a bargaining chip with Pope to secure the release of Tig from jail, which also ensured his own position at the head of SAMCRO was solidified by a new, loyal supporter. Over the last few episodes, Sons of Anarchy has taken a new direction where it is not afraid to move away from the status quo and now the fate of almost all of the characters seems to be on the table. During the third episode, I genuinely did not know if it would be Chibs, Opie or Jax himself who ended up dying (sadly, the promo for the show on Facebook had spoiled that someone would die by teasing, “Tonight, the Sons lose one of their own” – so I knew that not even Opie would fight off four people once inside the box) and that unpredictability is serving the show well. It is a shame to lose Ryan Hurst (Opie) from the show, but the direction that (creator) Kurt Sutter is taking it in now has made it must-see TV.